NOw, it’s a game that’s getting rave reviews at the moment for a lot of the right reasons although I would have to call it a little overrated as well. City builders are a very popular genre and after the dismal release and gameplay of the newest Simcity a lot of people seem to have been longing for a game that does the genre right and is a proper successor to the Simcity franchise. While Cities Skyline does seem to get the former right I would be hard pressed to call it a proper successor to Simcity, at least the games I fondly remember and played religiously. It is done very well. 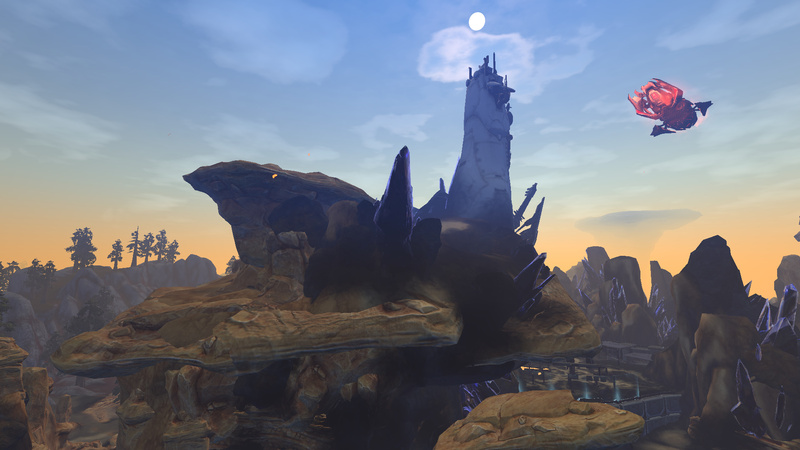 The foundations of a great city builder are here and they have improved on the formulae in a few areas. As per usual you can set particular types of areas you want between residential, commercial, industrial and office space. These grow depending on the demand within your city with the interest growing over time depending on what your city offers. It is great to see your city grow with these too as each type of building has a certain growth factor depending on the area and services. Eventually you go from small humble buildings to large skyscrapers. The policy and zoning mechanics are a new iteration on this as well, and a rather needed one that improves well on the formulae while adding new options and ways to play as well as a much-needed element of personalising your city. It doesn’t seem like much but being able to name these zones really helps you get involved with the game further. It’s more personal but I just wish there was more there. More ways to truly personalise these spaces beyond simplistic policy changes that really don’t change much. To allow only certain types of buildings and industries that could have even worked better with the different types of resources. Maybe even work in the benefits and consequences of these policies a bit better too, and the cost because once your city is properly running you have no problem enacting all the truly beneficial ones. You have the same kinds of services to employ: education, police, Fire, disease, death and a couple of others that need to be provided for your city to foster with most having a certain area they work within. There is less of an input with these though, you can up the budget but it doesn’t really increase the radius they work from what I see. Then there is the elements of beautification and special interest buildings although I don’t think this part was done very well. There is an achievement style system of unlocks, population based ones as well as some requiring a particular set of fields being fulfilled and while I get that they were creating elements of progression to play I felt it was mostly unnecessary, and at worse frustrating. I don’t want to have to fulfill certain unnatural goals and checklists just to get certain buildings. These could have just been gained during regular play or have the buildings used certain requirements better, needed buildings. bah thought i ammended here.. you can make bridges and transport lines along different planes… it’s awesome. Then there is the planning and road building aspect of the game that is probably the weakest, but not for the reasons that have usually been stated. 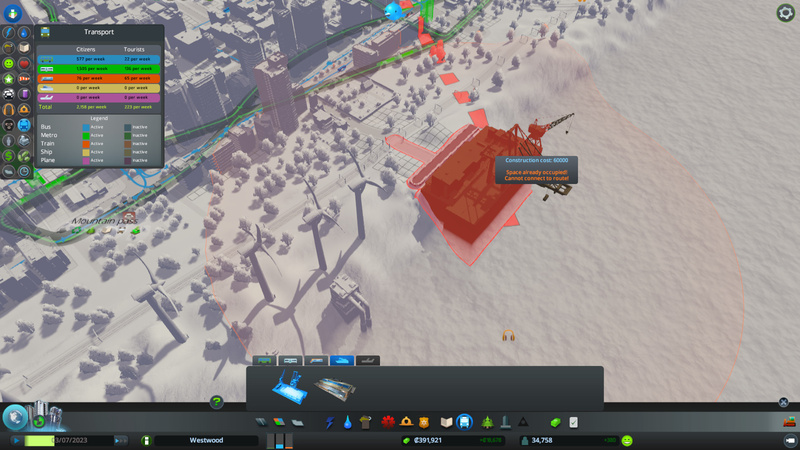 I think how they have planned the ai to move around the city is actually done pretty well. The have specific home points and destinations and these points need to be fulfilled so you get a lot of extra movement around the city, but it’s movement that is real not the kind of falsified Simcity way of presenting traffic. You see the cars moving the entire distance not just certain parts and filling out data points. 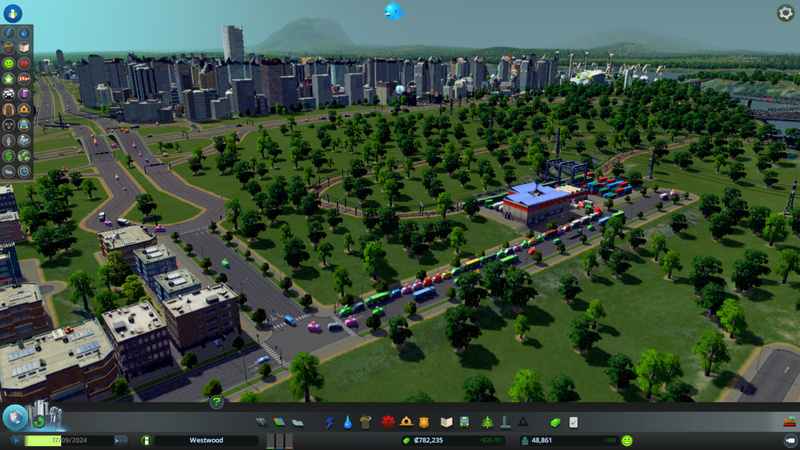 Unfortunately the AI, or road traffic mechanics aren’t very smart, or grounded in real life traffic movement. You’ll see at intersections traffic doesn’t move as it should, pathing goes through itself at times creating bottlenecks and it also doesn’t take advantage of times where the traffic could keep going, like short left turns. 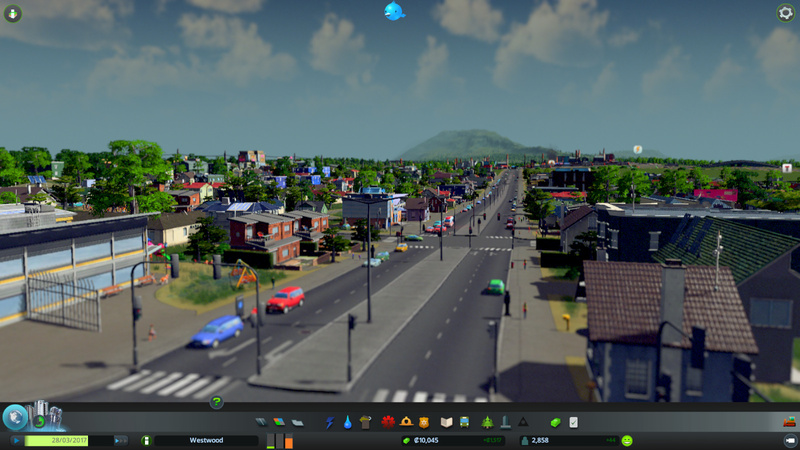 It doesn’t seem to use the entirety of the road lanes either which makes traffic build up as well. 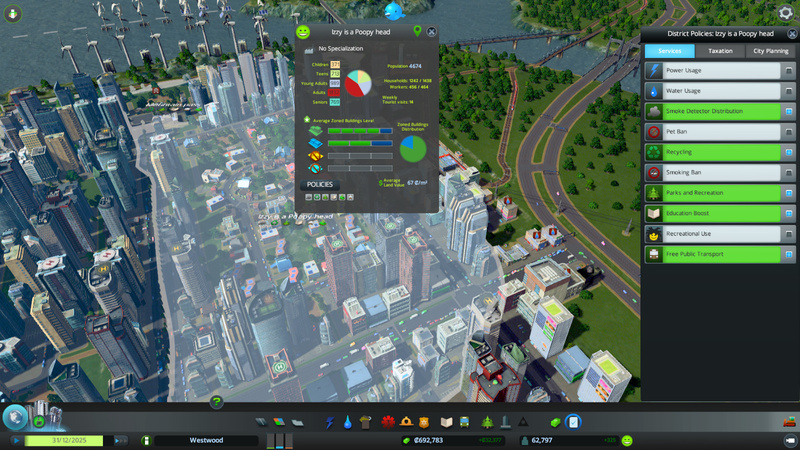 The other part that I find is an issue is the lack of options for building my roads and transport routes. It’s all on a singular plane and you create a lot of intersections because of it. It would be far better to have in-game methods of creating raised components and bridges but this is mostly left up to the modding to get. I miss underground roads as well. And then there are the railroads, a needed function for transport of people and goods but you have little customisation over the way you plan these. There are no bridges for railroads, intersections to use and from what I’ve seen no modding support to enable this either, it’s all for roads. The other element that is rather annoying me has been the placement of certain specialist buildings and how they always require a road present to complete. Most of the time this is easy enough but when it involves coordinating a road with a railroad or the shoreline it gets a lot harder. I couldn’t even get the ferry and cargo ship ports to work. Stop the nanny style of play and just let me put stuff down, it already has the tech for autocompleting pathways so it should be a non issue. I also felt there was just a lack of connectivity. You build a large city and it’s great as the bigger it grows the more space around it becomes available for purchase but I kind of want the feeling of interconnected cities, working together to share and sell. I loved the way in the Simcity 4 how you were specialising cities and their tools of production, which were needed and used by others while you were also gaining things from them. It was that feeling of symbiosis good city builders have… even Simcity 5 was able to pull that off, although in a smaller more restricted fashion. You were growing a world and here, while a large interesting city with different areas is still just a city. I want more than that now. I am enjoying it though, immensely. I love building the foundations of a city and then watching it grow and the way everything moves around is just fantastic. There is probably not enough differentiation in the building types, and zones end up feeling a little too similar (an issue solved through the modding to an extent) but the foundations of it, the elements and mechanics working behind that are done extremely well. From here though, I can only see it getting better as the modding community grows, the recent DLC they’ve unannounced plus the regular support they still plan on providing. 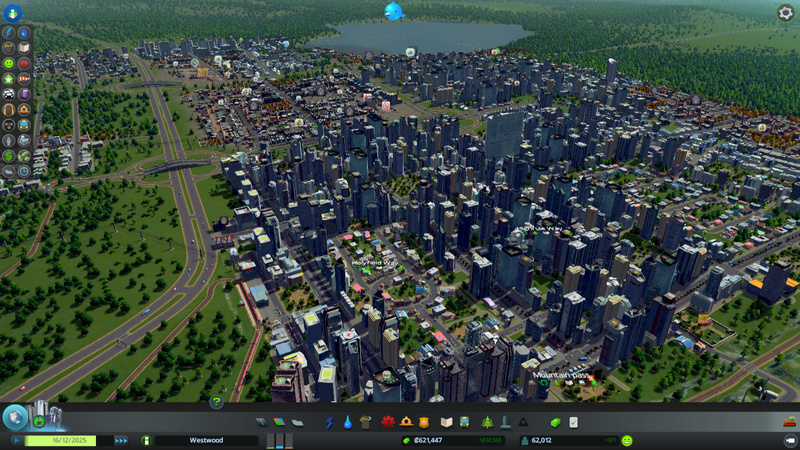 Also, I’m rather glad that in the face of Maxis closing we have a company that’s picked up the city building mantle.